This recipe should be made a day ahead then set over night for the best results. Pour the cream into a small saucepan then take the vanilla pods and with a small, sharp knife slice the pods lengthways. Taking the back of your small knife, scrape the seeds from within the pod and add to the cream in the pan along with the pods themselves. Soak the gelatin in some cold water to soften for about 5 minutes or so. Meanwhile, in a large bowl mix the egg yolks and sugar with a whisk and when the cream is fairly hot (but not boiling) slowly add the cream to the egg mixture, whisking constantly. Now drain the gelatin and squeezing any excess water from it whisk it slowly into the cream ensuring the gelatin has dissolved completely. You don’t need to whisk vigorously here, you just need make sure that everything is thoroughly mixed. Take a sieve and pour the mixture from the bowl over the sieve into a jug then pour your panna cotta’s into any type of glass or dish that you like. Cover with cling film then leave to set in the fridge over night. 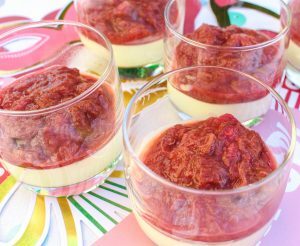 When you are ready to serve, add a good dollop of rhubarb compote and enjoy.